Welcome to Rialto II Theater! 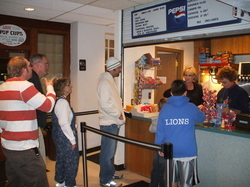 Located in Geneva, Nebraska, Rialto II Theater is a community volunteer second-run theater. Rialto II opened its doors to showing films in the small town around 1980. Managed by a board of directors, Rialto II is welcoming the advancement of new technology in the film world. Starting in 2012, all movies shown around the USA will be digital. As of April 21, 2012, Rialto II Theater is officially showing all movies in digital format. We thank everyone who contributed and supported the project to bring our theater into the 21st century. Please be aware that we will monitor any potential storms and reserve the right to cancel movies based on safety of the public. If there are severe weather issues in the area, please check our facebook page for our programming status. If local emergency personnel issue a storm warning calling for immediate “take cover” directions we will not allow any minors to leave the theater unless they are with a parent. They will be escorted to the basement and no one will be in the lobby to “meet and greet” parents coming to pick them up so, please, be assured we will do everything in our power to keep them safe.